OK. I admit I've been on a cherry kick lately, but we're in Michigan, it's summer and there are lots of fruits to be had. Yum. Enough said perhaps? Probably not, cuz we're in blueberry heaven right now along with currants, raspberries and blackberries. And we still have peaches, plums, apricots and more coming! 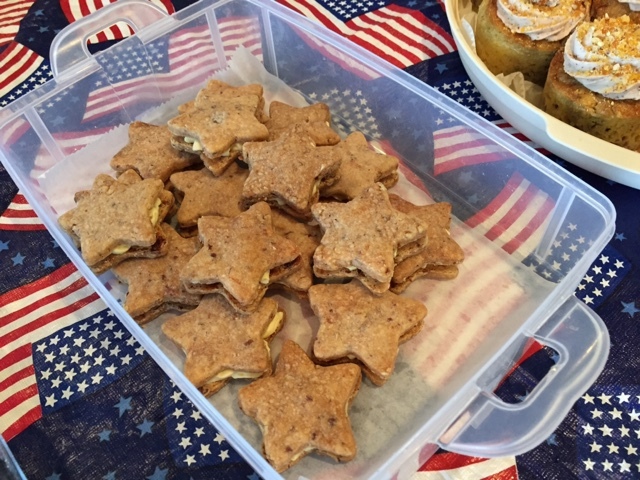 Before July comes to a close I wanted to share the goodies I had made for our July 4th celebration out at Clear Bottom Lake, one of our regular family gathering spots. Better late than never, right?. With cherries on the brain I opted for my own cherry almond cornmeal cake topped with cherry mascarpone cream. And why not! 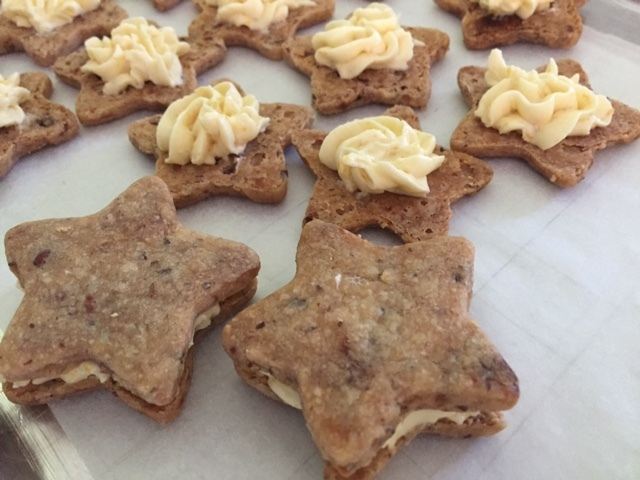 As if that weren't enough, I was in the mood for delectable all butter shortbread cookies, thinking stars would be just right for the classic American holiday. Sandwiched with orange honey buttercream? Absolutely! A straight forward preparation very reminiscent of many cake recipes one can find out there in the baking world, this one includes almond flour and cornmeal with the all purpose flour so there's a nice hint of crunch going on. Plus there's some buttermilk to add just the right tang. And of course some chopped sweet cherries are folded into the batter. 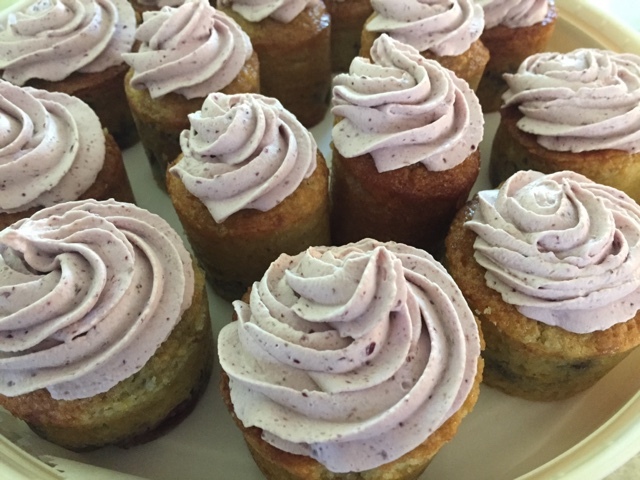 I baked the cake in individual silicone molds and decided to dress these babies up with cherry mascarpone cream and caramelized almond crunchies. 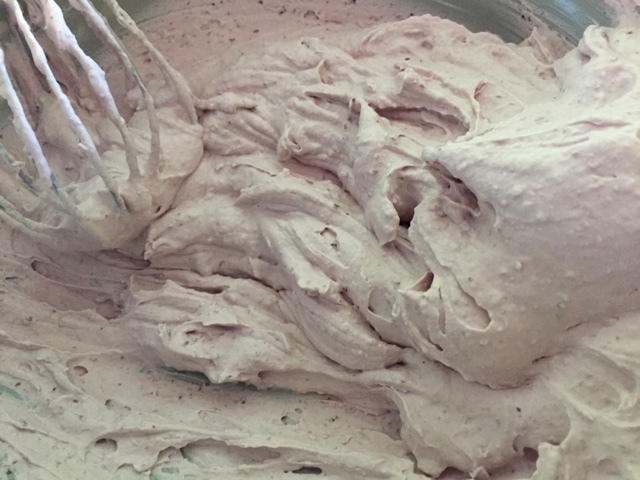 I puréed some cherries . . . .
and folded the purée into a half and half mix of mascarpone whipped with heavy cream. A bit of added powdered sugar and vanilla gives it just the right light sweetness. Pipe a nice swirl of cream on the cake and voila! 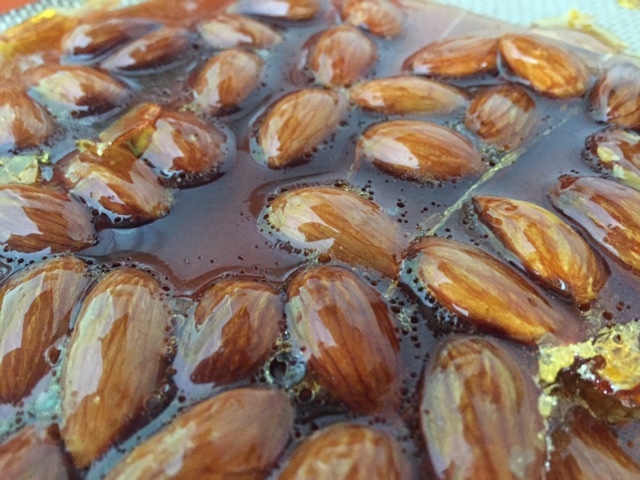 I made some almond nougatine by cooking 3/4 cup sugar with 2 tablespoons of water to an amber caramel, then stirring in 3 ounces of toasted almonds and spreading the mix out on a Silpat to cool. Then grind it all up and you have a delicious crunchy addition to almost any dessert you can imagine. It makes plenty for this purpose, but leftovers can be frozen in a zip top bag for other uses. These shortbread came about as a result of my receipt of some leftover pecan toffee crumbs from Patty, the owner and chocolatier of Patricia's Chocolate in Grand Haven MI. 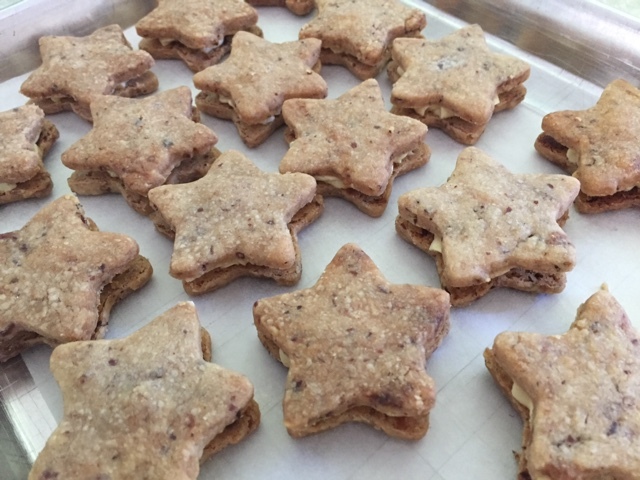 I used a similar base recipe to my standard shortbread, adding in a hint of cinnamon as well as the pecan toffee crumbs. Boy oh boy these are good! 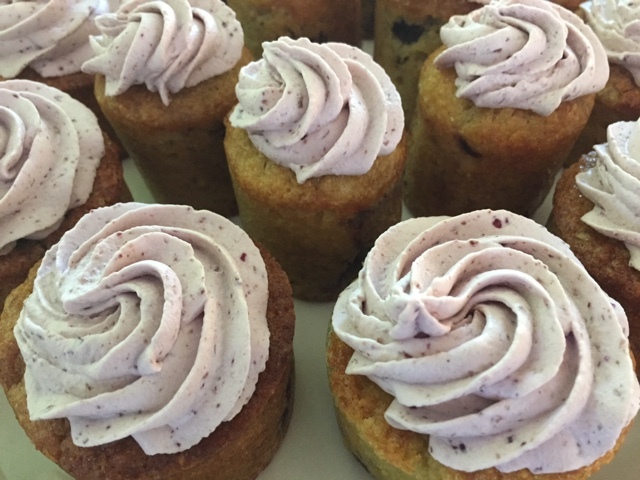 I wanted to gussy them up and happened to have some orange honey buttercream in my freezer. And thus it was that a stunning combination was born. 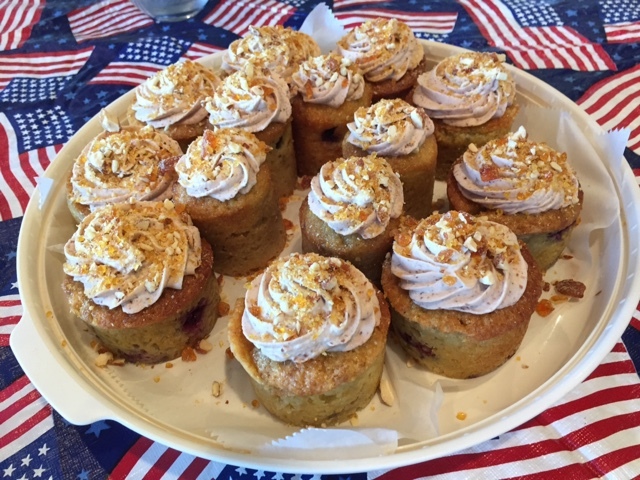 Cherry almond cornmeal cake with cherry mascarpone cream and almond crunchies. Heat oven to 350º. Butter a 9" springform pan or use individual silicone molds of choice. Stem and pit 3/4 pound of sweet cherries then cut into quarters. Set aside. Melt 113 g (one stick) unsalted butter, let cool a bit then in a medium bowl whisk together with 1/2 cup buttermilk, 2 large eggs and 1/4 teaspoon almond extract. In a separate bowl whisk together 130 g all purpose flour, 32 g almond flour, 70 g cornmeal, 2 teaspoons baking powder, 1/4 teaspoon baking soda and 1/2 teaspoon salt and 1/2 teaspoon ground coriander. Blend the wet ingredients into the dry. Fold in the cherries. Transfer batter to prepared pan or pipe into silicone molds. Bake until a toothpick inserted in the center comes out clean, 45-55 minutes. NOTE: if using small silicone molds baking time will be decreased. Blend 113 g/4 oz mascarpone with 120 ml/4 oz heavy whipping cream. Add 1-2 tablespoons powdered sugar and a splash of vanilla extract. Whip as you would whipped cream to achieve medium soft peaks. Don't over whip or it will become grainy. 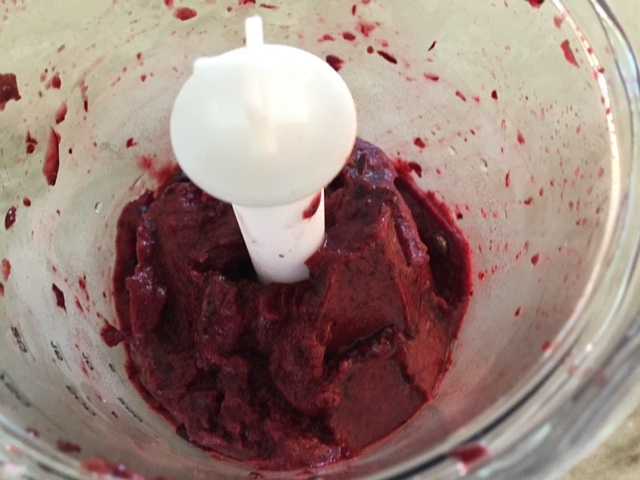 Blend in 90 g puréed cherries. Cook 3/4 cup sugar with 2 tablespoons water to an amber caramel. Stir in 3 ounces toasted almonds. Spread out on a Silpat to cool then grind in a food processor. Pipe decorative swirls on cake tops. 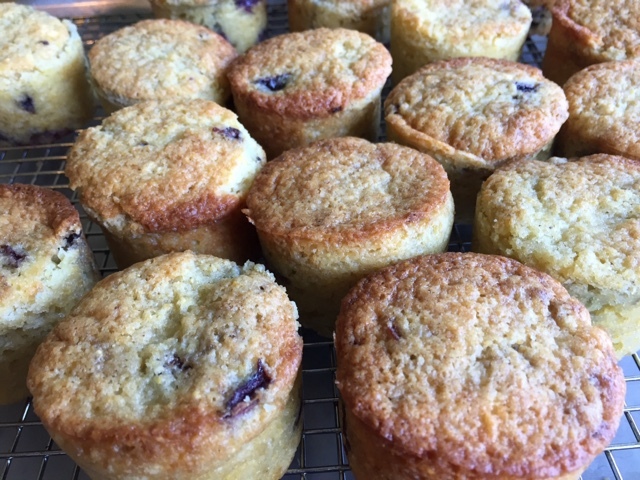 If serving later, refrigerate and remove from fridge 30 minutes before serving to allow cake to come to room temperature. Sprinkle with almond crunch and serve. In a mixer bowl blend 212 g room temperature unsalted butter with 75 g granulated sugar. In a separate bowl mix 260 g all purpose flour, 1/2 teaspoon cinnamon and a pinch of salt. Add flour mixture to butter/sugar mixture and blend until it comes together. Blend in 100 g pecan toffee crumbs (a gift from Patty so I don't know the exact recipe for these!) 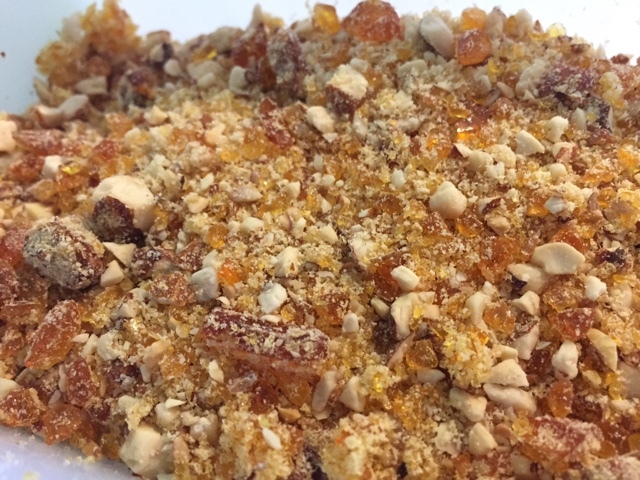 In a pinch you could substitute a mix of toasted, chopped pecans and some chopped Heath bar. Wrap dough and chill at least an hour then roll out and cut shapes of choice. Let cool then fill with desired filling. You'll find many recipes on line for Swiss meringue butter creams - use your flavor imagination and create your own!! Whew! That was a mouthful. Literally. 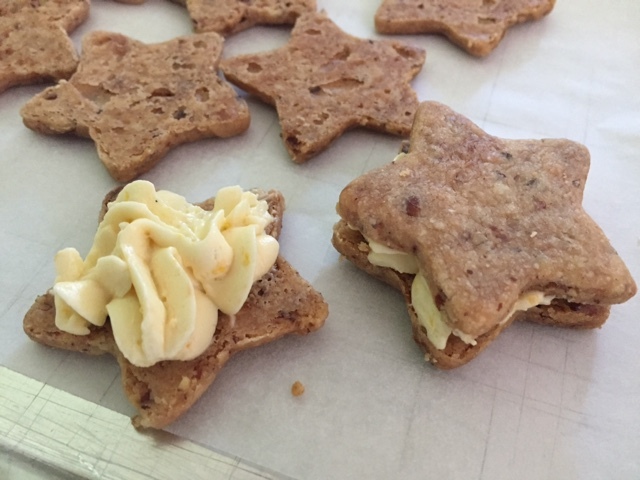 Both treats were enjoyed by the group at Clear Lake, especially the pecan toffee shortbread. Yes. Happy VERY belated 4th everyone!! Thanks for reading Baking with the French Tarte. See you next time around.